Some 3,000 Israelis and Palestinians, including hundreds from the occupied West Bank, participated on Tuesday, May 10, in an Israeli-Palestinian Memorial Day eve ceremony that was held for the 11th consecutive year in Tel-Aviv. The ceremony was organized by Combatants for Peace Movement in cooperation with the Parents’ Circle – Families Forum. The ceremony included speeches by bereaved family members who are active in different forums promoting dialogue, reconciliation, and non-violence in Israel/Palestine. Among them: Neta Shemesh, a mother of three and grandmother of two, who lost her mother when armed Palestinians infiltrated her kibbutz in 1974, and lost her brother in the first Lebanon War; Adan al-Masri, a mother of eight from Nablus, whose son Wassam was shot in the head during violent demonstrations at Joseph’s Tomb in September 1996; Yigal Elhannan, who lost his sister Smadar in a terrorist attack in downtown Jerusalem in September 1997, and Arab Aramin, whose 10 year old sister Abir died from a rubber bullet fired by a border patrol police officer while she was walking home from school. 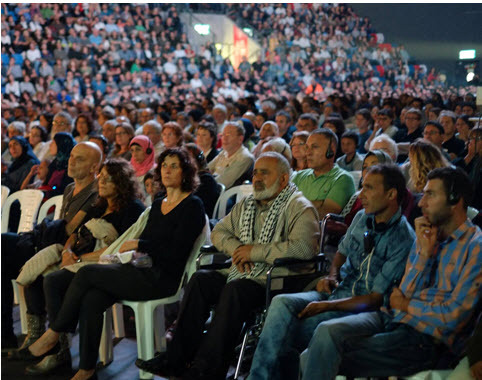 The ceremony included performances and speeches by some notable artists such as Ohad Naharin, the artistic director and choreographer of the Batsheva Dance Company, Sha’anan Street, the lead vocalist of “Hadag Nahash” and the Arab-Jewish women’s choir “Ranah.” The ceremony was also attended by several activists from Hadash and the Communist Party of Israel, among them MK Dov Khenin from the Joint List. On the evening of Wednesday, May 11, with the start of Israeli Independence Day, Yesh Gvul held a special ceremony opposite the Prime Minister’s office in Jerusalem: “Lighting torches to represent putting an end to violence and the occupation and to express the hope for peace between Israel and Palestine and the fulfillment of social justice in our country.” Several peace and social activists were honored for their struggles by being called to light a torch during the ceremony.